Mallet, Chain and Medicine Ball Fitness | Robert Mitchell Jr. 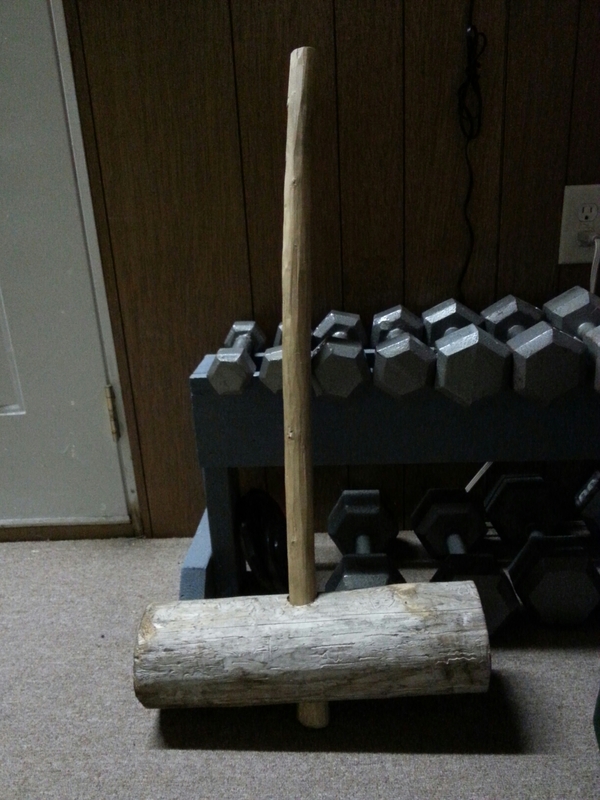 When I made this mallet to use for fitness training I laughed until I cried real tears. Just holding it in my hands made me feel like Mario smashing barrels in the original Donkey Kong game! The handle is a solid 34″ maple stick (couldn’t find a good piece of hickory) and the head is a 6 lb hunk of cedar log. The stick is about 1.25″ diameter at the bottom and 1.75″ at the top. I drilled the log hole 1.5″ and slipped it over the handle. A few head-down raps on the patio and it’s held there by friction alone. It ain’t going nowhere. For Mettlecraft month at the martial arts club (in Cabal Fang martial arts, Mettlecraft is the discipline of building fitness, determination and guts) we’ve been bracketing every session between a full pyramid of calisthenics at the beginning and 10 or 15 mins of conditioning at the end. A pyramid is 1 of each exercise, 2 of each, 3 of each, 4, 5, 6, etc. up to the peak (usually 8 to 12 depending on the exercises) and then back down again. Total reps equals the square of the peak. In other words, a full pyramid to 10 is 100 reps. For the closing we’ve been doing HIIT workouts (High Intensity Interval Training). Here’s a video of the HIIT we did on Saturday, featuring the new 6 lb circus mallet, a 20 lb chain and a 12 lb medicine ball. We ran 18 rounds (6 circuits) of 30 secs with 10 sec transition breaks between. As I say in the video, this is how you burn off Christmas cookies. This entry was posted in Martial arts and tagged chain, fitness, mallet, medicine ball, sledge. Bookmark the permalink.